15 January 2018, New Delhi: Tele marketing calls and SMS have become a routine way for many companies to reach out to prospective customers. All of us at some point in time, have been pestered by these spam marketing SMS and calls. Even registering for the Do Not Disturb list is not of much use. To control these unwanted marketing calls and SMS, Telecom Regulatory Authority of India (TRAI) is set to come out with fresh DND guidelines by January 15. 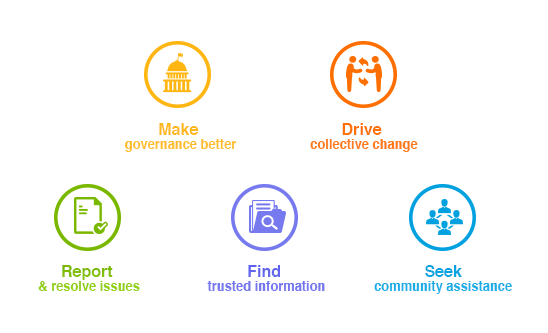 To ascertain collective citizen experiences, LocalCircles conducted 2 polls to understand if people were in fact getting messages despite being on DND. More than 14,000 votes were received on the survey. 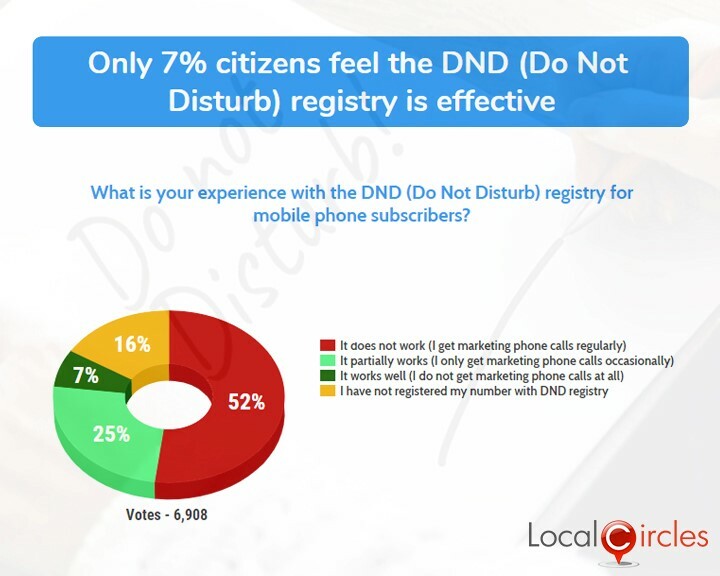 The first poll asked citizens what was their experience with the DND (Do Not Disturb) registry for mobile phone subscribers. 52% said that it does not work at all as they get regular marketing calls and SMS, 25% said it partially works, 7% said it works well and they do not get any marketing calls and SMS, while 16% said they have not registered their mobile number on DND registry. The Telecom Regulatory Authority of India (TRAI) created a NDNC Filter i.e. National Do Not Call Registry which is fully run by Indian Government. The main purpose for creation of NDNC was to prevent unwanted Marketing SMS and calls from Telemarketers. Apple Inc. on the other hand has agreed to provide a framework to support the telecom regulator’s mobile app that can report spam calls and messages on iPhones. The second poll asked citizens how many unsolicited SMS they received every week even after being registered on DNS. Shockingly, 29% said they received upto 10 SMS, 32% said they received 10-30 SMS and 18% said they received more than 30 unsolicited SMS every week. 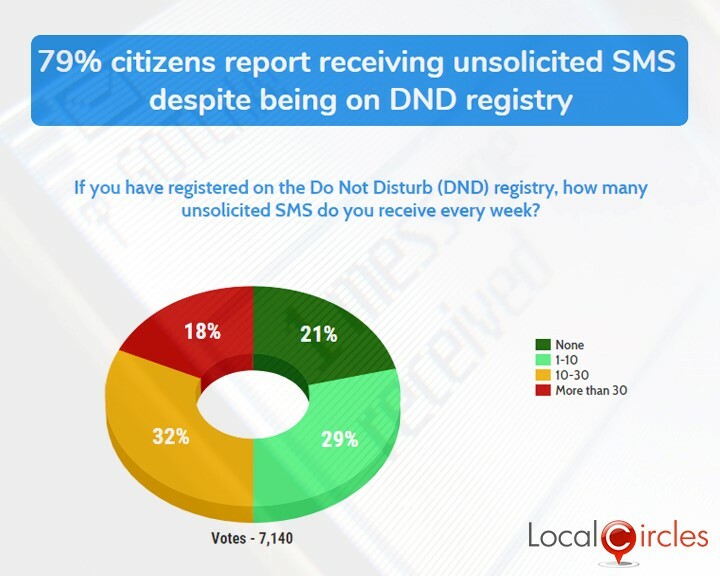 Only 21% said they do not receive any unsolicited SMS after registering on DND. Citizens said that TRAI should take strict actions against SMS spammers and companies who do not honour the privacy of DND users. They also said that the telecom companies should put processes and filters in place to make sure that subscribers who are registered on the DND do not receive spam calls and SMS.